Press Fit - India's Leading Brand of Electrical Products - offers a restricted slot design, made using rigid self-extinguishing PVC Panel Trunking that are superior in quality and affordable in price. 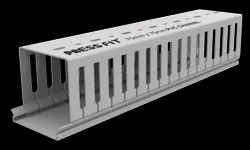 Press Fit presents to you its range of slotted panel trunking, meant for a simple, clean, and organized installation of panel wiring. Press Fit’s Slotted Panel Trunking is used for supporting and organizing bundles of wires/cables in control panels, distribution boards, switchgear, network racks, etc. 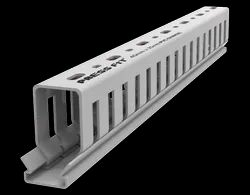 Commonly known as PVC Channel, the primary application is to provide a secure and organized channel for the wiring. Press Fit’s Panel Trunking is made of rigid, self-extinguishing PVC which ensures security under harsh conditions. With a huge range of sizes, our Trunking can be used for all types of small to large wires and cables.